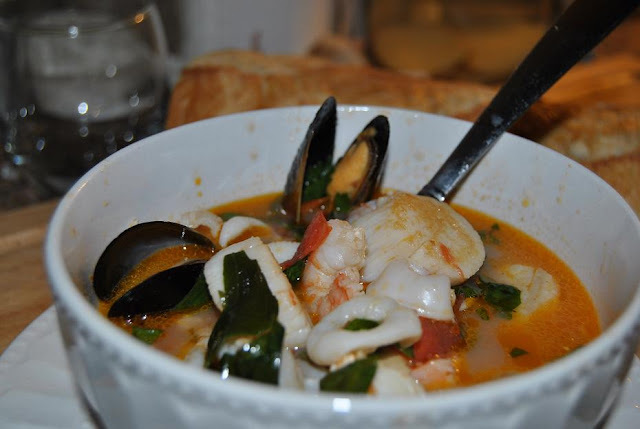 The BEST Seafood Stew Ever - One you'll remember! This stew consists of very few and simple ingredients. It's clean & nourishing. Hearty enough for Winter, light enough for Summer. Perfect. Heat the oil in a 4 to 6 quart dutch oven or sauce pot. Add the crushed garlic and saute on very low heat for about two minutes or until the garlic is fragrant but not browned. That looks delicious...and so easy to make! Jackie, thanks for stopping by. This stew is so good. The flavors are just perfect. The basil adds that special touch. It is expensive, my brother and I call it the $100 soup. We made a big batch and added squid & mussels extra. We only do it about once or twice a year because it's pricey, but that keeps it extra special!